Today for #SundaySupper we teamed up with American Family Insurance to share with you old favorite and comfort food recipes turned into a healthy version. 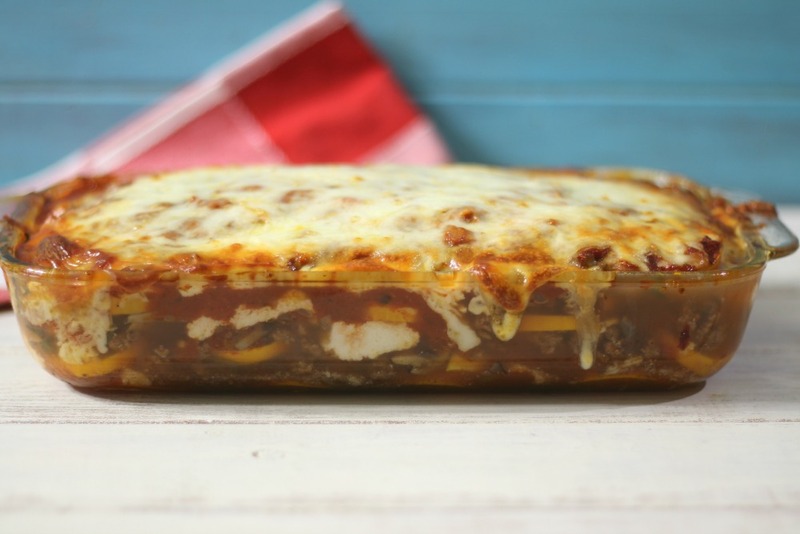 One of our favorite comfort foods is good old fashion lasagna. So I thought how can I take this family favorite and turn it into something healthy that the whole family will love? Why not sub the lasagna with zucchini? After all I have so many zucchini’s from the garden that I don’t know what to do with it! 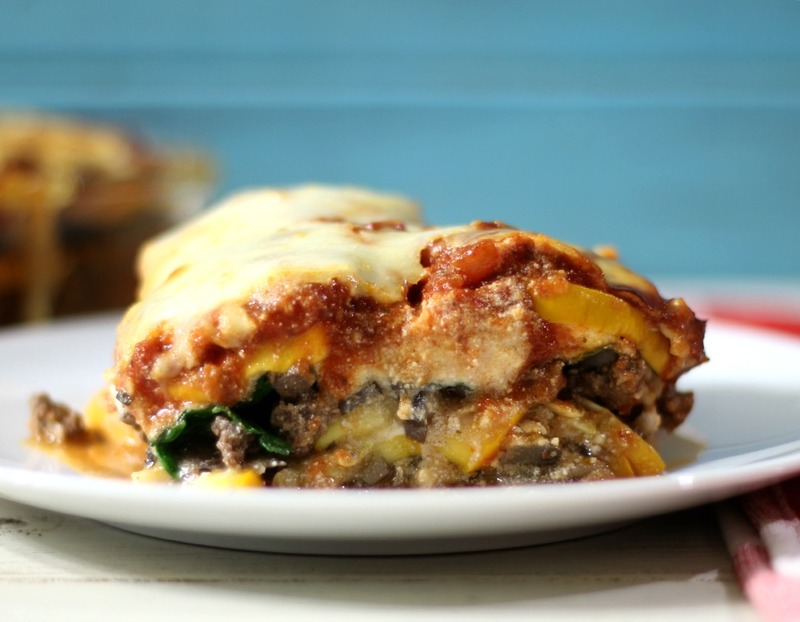 So today I share with you our new favorite pasta-less dish Zucchini Meat Lasagna. 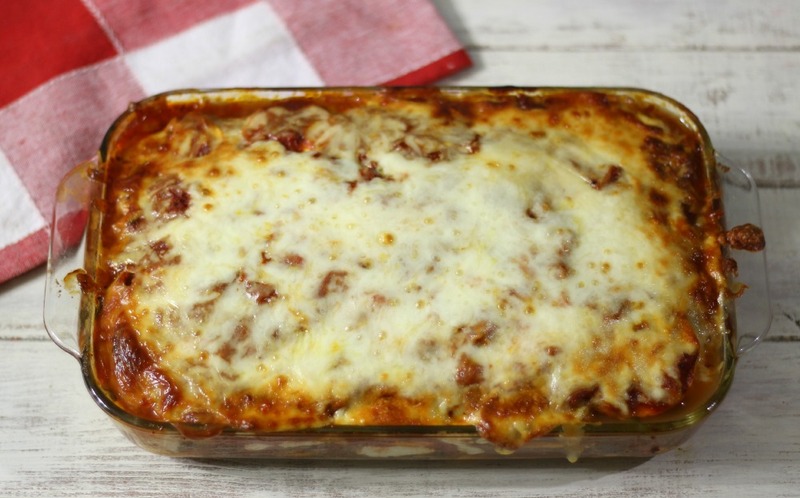 This is one fatty, thick, delicious lasagna. It’s kind of like vegetarian lasagna meets meat lasagna. It really, by far exceeded my expectations and to boot, my family loved it! It’s made with fresh zucchini, spinach, sautéed mushrooms, lean ground beef and lots and lots of cheese. It’s a great low carb dish, and it’s gluten-free! It’s the perfect comfort food and perfect for using up the bazillion zucchini’s that I have! You Guys have no idea how many zucchini’s I have. My one plant turned into two and I must pick one or two zucchini from it everyday! This dish takes a little bit of time to make, but well worth effort. It makes 8 big, filling slices and has enough cheese to make your heart scream! Yeah, I kind of like cheese! 🙂 It’s super easy to make too! I cooked my ground beef with some onions and garlic, set it a side and then sautéed up some mushrooms. Yes, I used mushrooms again. Their kind of growing on me. Crazy I know. I did cheat and use jarred pasta sauce, and that’s ok! Sometimes we need to cheat a little. Then I layered everything with sliced zucchini, ricotta cheese, meat and mushrooms and of course topping it with mozzarella cheese. Yummy!! I think you will love this dish, just as much as we love it! When making this recipe there are a few things you need to know. For the zucchini I used yellow summer squash, since that is what I am growing in the garden, but green zucchini would work great too. Also since I didn’t use noodles the zucchini can become a little watery, so don’t be surprised if you have quite a bit of liquid, but trust me you don’t notice when you eat it! Oh and get this, 8 HUGE slices is only 193 calories and 15 carbs! Woohoo! Guilt-free lasagna! I love it! Yes, with those stats I’ will be making this all summer long! 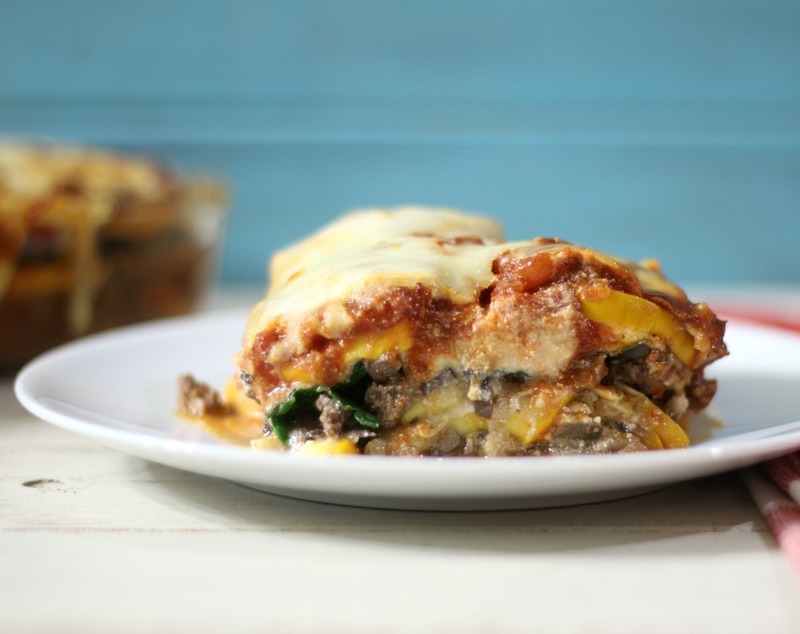 A thick, hearty noodle-less lasagna made with zucchini, ground beef and lots of cheese. A perfect low, calorie, low carb pasta dish. 5 cups zucchini, sliced about ¼"
In a large skillet, over medium heat; add ground beef, onion and garlic and cook until beef is no longer pink, about 10 minutes. Drain the fat. Add beef to a bowl; set a side. In the same skillet you cooked your beef in, add mushrooms and chicken broth. Saute over medium heat until mushrooms are tender and chicken broth has evaporated; about 10 minutes. Spray a 9 x 13 baking dish with cooking spray. Spread about a ¼ - ⅓ cups of pasta sauce to bottom of dish. Add 1 layer of zucchini to the bottom (cut zucchini in half if it doesn't fit), top with ½ the ground beef mixture, half mushroom mixture, half fresh spinach, top with half the ricotta cheese, top with another layer of zucchini and remaining ground beef, remaining mushrooms, remaining spinach and remaining ricotta cheese. Top with remaining zucchini and pour pasta sauce over the top and spread until evenly layered. Sprinkle top with mozzarella cheese. Cover with aluminium foil and bake for 40 minutes. Uncover and bake 15 - 20 minutes until cheese is bubbly. Let the lasagna sit for 5 -10 minutes before serving. board to get more ideas on fresh, beautiful, family recipes turned healthy. You can go here to check it out!! Be sure to also check out the rest of the #SundaySupper gang to see what their family favorites turned healthy. Brilliant to use zucchini for the pasta! And who cares if it is a little watery. I’d take that over a dry lasagna any day. Thank you Renee! The water part isn’t bad and you really don’t notice it! The water has flavor so it’s all good. Genius! I have a bit of a love affair with zucchini, but I’ve never used it this way. I can’t wait to try it. Um…YUM!!! That looks so good. What time is dinner? 😉 Cannot wait to make this. lol, Come on over! 5pm! Bring on the squash! I’ve been wanting to make a version with zucchini as noodles. Yours looks like a winner! Thanks Katie! I bought a zucchini noodle maker machine and i Have yet to use it. I am thinking of traditional pasta with zucchini noodles! I love that this can sub for pasta. 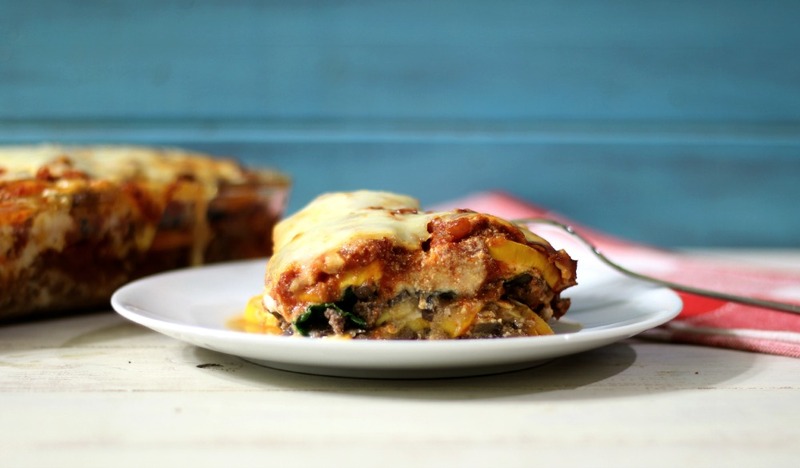 I need to take this idea to transform my “World’s Best Lasagna” into a healthier, gluten free version!! Ohhh, I bet your lasagna must taste good! I do believe that this lasagna would be utterly guilt-free. YUM! I know, Pasta is a comfort food for me too, but I didn’t miss it in this dish! YUM!!! This right up my ally! I love it! This looks so yummy! Maybe hubby would eat zucchini if I served it this way…hmmm. My Husband hates zucchini but he loved this dish, so maybe it will work with your Husband? Love sneaking in those veggies! 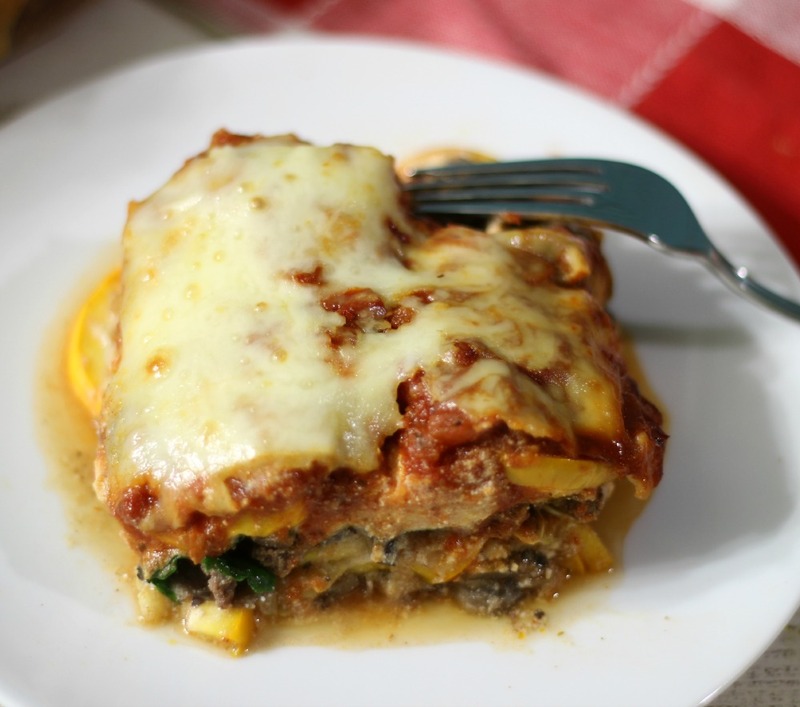 I always sort of made separate meat and veggie lasagnas but this combo will change that! Hi Cindy! Try the combo, it’s amazing! Simply perfection to use zucchini instead of pasta. Love it! Thank you Bea! I didn’t even miss the noodles in this recipe and either did my family! For me, lasagna is the perfect comfort food. This looks amazing. Love this combo. We’ll have plenty of zucchini from the garden this year, so this is a must try. Pinned. This looks amazing! Dumb technical question. Is there’d peeper sauce from TJ’s? I don’t know if they have pepper sauce, but they have some great pasta sauces. I love the tomato basil one! Just get whatever kind you think you would like! I really need to start using zucchini instead of noodles. This lasagna looks amazing! Thanks for the tip on the moisture of the zucchini. Thank you so much Sarah!I love zucchini as noodles, it’s so fun! This sounds great! How many zucchinis or yellow squash did you buy to make 5 cups? I would say about 4 zucchini would be good.